I have finally decided to coordinate an Art Exhibition to showcase my paintings and conduct the charity which I promised about four months ago. I painted rigorously for about two months after which I had problems with my eyes - which was diagnosed about a month later as exophoria (aka Convergence Insufficiency) - a kind of heterophoria. I then stopped painting and joined Leo Club of Bharatpur, in order to participate in social service, develop leadership and so on. After three months, I am coordinating a first program, in which I will be exhibiting my own paintings. The theme of the exhibition is "Painting for Charity". 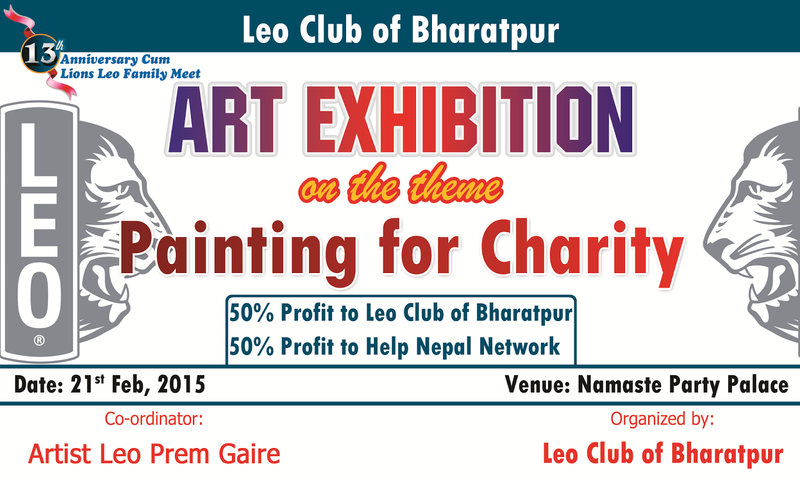 I am planning this exhibition alongside another program, the 13th anniversary celebration of Leo Club of Bharatpur, and Lions Leo Family Meet. Therefore, I will be utilizing the same venue which will have dual benefits, lower cost and plenty of visitors. Today, I made this flex banner. The paintings have already been framed about a month ago. The venue, date, and audience were automatically managed. I have already decided on how to split the profit (after covering the cost of art materials and framing, which I have decided at approximately NRs. 700 for each painting) from the painting. Half of the profit amount will go to Leo Club and remaining half will go to Help Nepal Network. Therefore, I am almost ready to go. However, I have not decided on the prices yet which will be done in consultations with fellow Leo Club Members tomorrow. I am thinking to charge around NRs. 2000 for each paintings, most of which are of A3 size. However, this is not final. I will post updates about how the program goes tomorrow.